OnePlus 6T Chinese company coming with an in-display fingerprint sensor is the first smartphone of OnePlus. If seen, this technique is now in practice. New biometric technology has stepped up in the market when demand for fullscreen is increasing. 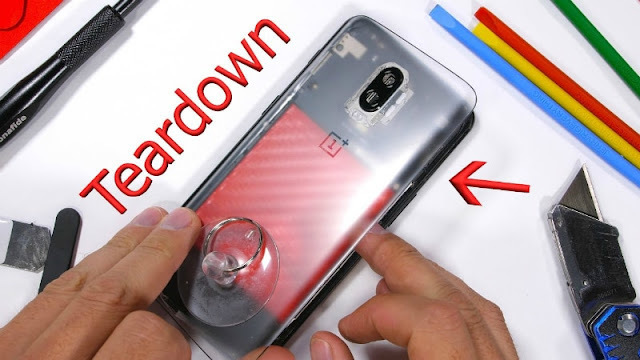 Now the JerryRigEverything jack teardown OnePlus 6T so that all the parts inside the OnePlus 6T can be known. The most important part of this teardown is the Optical In Display Fingerprint Sensor of OnePlus 6T. Which is actually a small camera sensor designed to light up during the operation. In Teardown, Jack has initially removed the back panel. After this, the battery of OnePlus 6T is shown out After this, the black plastic panel is equipped with the NFC chip. This panel gives protection to the motherboard. After this, the dual camera module has been removed from the motherboard. Here the primary sensor is equipped with optical image stabilization. This feature is not part of the secondary sensor. After this, he removed the existing Protective plastic cover on top of the fingerprint sensor. Charging port is slightly above the optical in-display fingerprint sensor. After this, he has removed the fingerprint sensor which is equipped with a camera lens and sensor. Actually, it takes to close up photo of your unique fingerprint and records the fingerprint for future by using the existing illuminators on the display. If Jack believes that this technology can be used in the future to put a selfie camera in the display. After this, the display of Leave Design will also be discontinued. When the sensor is taken out, the translucent hole looks. After this Jack showed that the screen works even after the fingerprint sensor is taken out, but the back does not shine. Zack said, "The LEDs of the screen just shine a folding." After this, they put together all the components together and showed that the fingerprint sensor is working. JerryRigEverything was a live video that tested the robustness of OnePlus 6T in the past month, on YouTube channel. The test showed that the in-display fingerprint sensor had no damage from the scratches.